In and around the local area, Pigeons, gulls, crows, doves and many other wild birds can cause serious damage to a buildings' structure. York and the surrounding towns and villages provides a great opportunity for both rodents and wildlife to thrive. As well as Insecticidal spray treatments, HuntCatchKill use a number of other control methods against insect pests. HuntCatchKill are a certified National Pest Technician Association (NPTA) member is a local company providing professional services for both business and domestic customers. 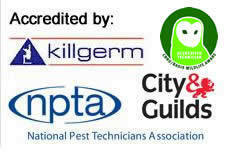 Established in 2010 we offer Pest Control York services to the city and all surrounding towns and villages in the area. We specialise in all aspects of pest control such as vermin which includes moles,rats, mice, squirrels, rabbits and foxes etc. We use various techniques which accommodate both the environment and terrain from baits, humane traps, break-back traps or shooting. Having recently obtained the City & Guilds Level 2 Safe use of Aluminium Phosphide for Vertebrate Control we can also offer gassing of burrows, effective in control of rabbits, moles and rats in rural and other suitable locations. In regards to insects both crawling e.g. cockroaches, ants, beetles ,bedbugs etc and flying e.g. wasps, flies and moths etc we use only 2nd generation baits, gels and sprays. We also offer advice in the prevention of infestation with various barrier techniques such as screening for windows and doors, electric devices etc. Birds such as feral pigeons, wood pigeons, magpies and gulls are also considered pests due to the general nuisance factor, crop damage, or their droppings and nests, which carry certain health risks to humans. We offer control and elimination and various types of prevention such as nets, spikes for buildings and just recently a new type of optical gel which prevents birds roosting. We offer a free initial consultation and advice and all our work complies with Health and Safety and COSHH legislation and ensures our business clients comply with Environmental Health legislation. In addition to “one off treatments” with contracts we believe that the service we offer should be specifically designed to target the customer’s needs at a competitive cost and not be a blanket quote for all eventualities which in some cases would never occur. Our Pest Control Services cover the city of York and a radius of 20 miles.